Now I assume that the spoon was part of a set given out by some cereal or whatsoever, and I suppose that there must be others with handels in the shape of Littlefoot, Cera, Ducky and Petrie. Sadly I didn't get the slightest hint on who produced that kind of spoons. Does anyone of you know anything about it? I like the tin figure....quite realistic. I thought you had planned on doing another 3-d figure. Who or what is Denny's? I have planned a 3D figure of Cera. Her head is finished, but recently an attempt to create a mold of her body failed. With the silicon rubber the molds consist of being rather expensive stuff such a failure is quite costly. Anyway, I will continue to work with the Cera, though it may take some time to finish molds for her body and limps. Still I'm very interested in getting hold of more of such spoons or the like to create more figures similar to the Spike. I'm not really happy with the color of him. I sort of chose the standart colors which are associated and which in a few scenes match the colors in the movie. However, usually his color is much more pale like a great deal of white was mixed into the green. I may paint another spike tin figure in a different color pattern. Denny's is a restaurant chain. I'd say mid-90s they had LBT plastic cups for some reason that came with kids meals. I do get what you say about the coloring...Spike was pretty dull in color in the first film. You gave me a keyword I needed to find out about the spoon at google. It was not made by Denny's, but Denny's was just one out of a couple of places where they used LBT promo stuff in the aftermath of the release of LBT 5. I found out that the spoons were produced for Dairy Queen Restaurants. 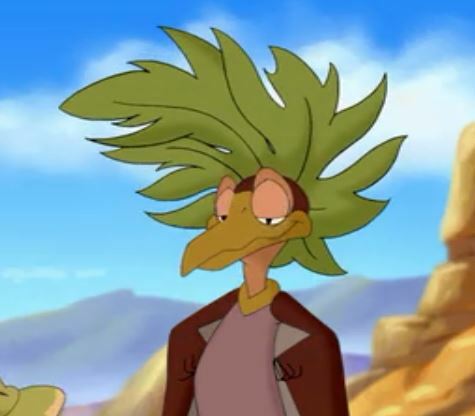 I also found out that indeed other than Spike there were spoons in the shape of Littlefoot, Cera, and Ducky. You know, just for you Malte, I went to see if my parents still had that LBT cup in the cupboard where we still have all those plastic cups. I found the Disney ones that Burger King gave out in the mid-90s but no Denny's LBT cup. Sorry. However, a cup would probably not be suited to make an LBT tinfigure out of it (unless it is shaped like an LBT character, and even then it would most likel be to large to make a good figure of it (and one that does not consume an extremely high amount of expensive tin). The Littlefoot and Ducky brooches were the positive for my first LBT tinfigures which you can find in the LBT gallery www.lbt-gallery.de.vu (Galleries-Malte-Artwork-page 3). I meant just using the cup as a reference point...anything with the characters on it could be a reference point. In 1988 when they first brough Land Before Time to life they brought out all types of items for it. cups, lunch boxes, all the usually things to show a big realise and that was like the normal thing at the time of 1988. Yeah, back in 1988 it would've been a common thing. Also, these days such things would go for a pretty penny. Who knows, there might be a BIG fanatic out there who has so much LBT stuff preseved in a glass case and all for all we know. Realistically, the only LBT item that goes for a "pretty penny" is the soundtrack. Otherwise, everything else pales to that. What exactly does that phrase "to go for a pretty penny" mean? By the way, I forgot to mention that in early November I got the other spoons I had been looking for. The spoons of Ducky and Cera will make as good positives for tin figures as the one of Spike did. The Littlefoot spoon is not as good (he is in a strange sitting posture and his head seems a bit too small). The spoons came along with LBT cups and lids for the cups shaped as pieces of LBT landscape (rocks, plants etc.). I consider making moulds for these lids to use them as sockets for the tin figures. Those lids are too large to cast them with tin with the tools I have (apart from the fact that it would be very expensive) so I consider using plaster for them. "Pretty penny" means "alot of money." As for the figures you're making, if you really want to save money, I'd suggest an inexpensive clay like "Play-doh" to actually make them with. Then again, clay does break easily, (Which is why people make it harden by extreme heat. Just so it has a lower chance of breaking.) so it might not be a good idea. Thanks for the explanation. Now I see what you mean. However, I can assure all of you that sometimes you get land before time stuff really cheaply from ebay. Admittedly, I sometimes had to pay a pretty penny too. But more often I was highly pleased with the low prices I had to pay despite the fact that transatlantic shimpment makes it more expensive for me than for you (most LBT items are to be found in the states). Often the shipment exceeds the price for the stuff. As for the figures I'm creating, I'm aware that clay would be cheaper. I have a few land before time clay figures and also some I carved from soapstone. However, the deal is that I am creating moulds which allow me to cast land before time figures with liquid tin (pewter to be precise). This way I can create many figures with the moulds and just have to paint them. Of course I don't have hundreds of identical land before time figures standing in my room but I sent some to good friends and fellow land before time fans of mine as birthday presents. Apart from that working with the liquid metal has a special attraction of its own, as does carving, or working with clay. Hm, just tonight I went to a music store I never go to and I saw a used copy of the LBT soundtrack that went for $29.99. I sure was tempted to buy that because it goes for at least double that on ebay if you keep your shipping costs low. Didn't do it though because its just a hassle in winter up here to get to the post office and all. What I meant was that I could have bought it for $30 at that store, and it would've sold for probably about $50 plus shipping on ebay. I already have an original copy of the cd - and lucked out price wise and scared a lot of people away with my bid.